Great conversation about Exit Tickets around the hearth at #TLaC Towers yesterday. Topic: Exit Tickets- Specifically, “What About Them is Most Important”? Our conversation was divided into two topics: blank Exit Tickets (what does a well-designed Exit Ticket look like?) and filled out Exit Tickets (what do you do with the data afterwards?). My biggest takeaway from the conversation was that one of the dangers of Exit Ticket analysis was the summative crowding out the formative–put another way, the potential for quantifying to crowd out analysis. This may seem counter-intuitive because we associate data with analysis but here’s what I mean. If I gave my students an Exit Ticket about my lesson which was on X, which of these is a better takeaway? 76% of my students mastered the content. They did really well at A but struggled with B. To me, the second is a more useful response. It’s not quantified as well, but it represents not only my thinking about what I need to address the next day, but represents me developing my teaching intuition, or my understanding of my kids’ thinking. Over the long run, this is hugely valuable. I am not saying knowing the 76% of kids mastered a lesson isn’t useful. It is. A lot of teachers I know do this, and then make a list of the 24% of kids who didn’t master and tutor them or target questions to them in the next session. But because that’s so quantifiable, it’s easy to do and easy to do instead of the the deeper reflection on the general tendency of the class to “get” some things and others and thus, probably, to better understand the strengths and areas of challenge for my own teaching. Anyway, in the course of this discussion, I also re-read the section of the book where I share guidance from individual teachers. Their advice, as you might expect, is really good, so I thought I would re-print it again below. If there are folks out there who have additional insights to share on Exit Tickets, please comment away. Because Exit Ticket is one of the most commonly used and deeply trusted techniques in the book, I recently asked some teachers for their advice, and the results were pretty amazing. The insights came from the United States and the United Kingdom; they came from district school teachers, charter school teachers, and private school teachers. They came from teachers whose lessons I’d watched and admired, and teachers I’d never met. Here are a few gems. One of the key themes was reviewing the data. Teachers advised looking at the data quickly and using a standard, low-transaction-cost way of processing to make it easy to take action. Leanne Riordan of Baltimore suggests looking at the Exit Tickets as soon as you can, right after the lesson if possible, and sorting them into three piles: Yes, Some, and No, based on the responses. After looking for reasons that students missed a concept entirely or grasped it partially, make quick notes right on the Exit Ticket. You can then use these piles to differentiate small groups the next day or to create a Do Now for the whole class if needed. As an added tip, keep the No pile on the top as a reminder to check in with those students more frequently the next day. Alternately, tracking the number of students who get a certain score—5, 4, 3, 2, 1, or 0—and adding notes to sum up misconceptions can help you stay accountable for grading nightly and give you a glimpse of how the lesson went. Hand in hand with reviewing results quickly is creating a format that makes it super easy to do. For example, Janice Smith, from Durham, North Carolina, uses sticky notes, having students write their name on the front and their answer on the back. On the way out of the classroom, students stick the notes to the door, allowing Janice to quickly flip through them between classes and easily enter data in a spreadsheet later in the day. Regardless of whether you use handouts or even just have students write their answers on something as simple as a sticky note, ensuring consistent placement (a variety of Standardize the Format) makes reviewing answers far more efficient. 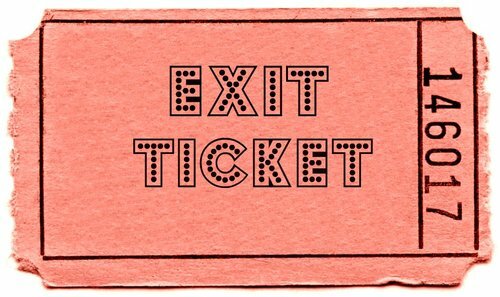 Another common theme surrounds the purpose of Exit Tickets. One teacher in the United Kingdom talked about the importance of having a “clear sense of why you are using Exit Tickets.” If Exit Tickets show poor understanding across the class, then reteach; if Exit Tickets show just a few students to be struggling, then that small group may need a separate intervention; if the class kind of gets it, but is a bit unsure, then focus on weak spots for homework or during regular ten-minute slots for a few weeks; if Exit Tickets reveal the class to be very secure about a certain topic, then schedule a refresher in a week or two, but don’t give this topic too much time, as there will be better things to use it for. In short, responding to Exit Tickets is often about being entrepreneurial with time. Alexa Miller, a fourth-grade teacher in New York, addressed that theme as well, saying that she leaves Exit Tickets in student mailboxes to be corrected the next morning. This works well for elementary, because students can fix mistakes during breakfast while the teacher Circulates to assist and recheck. This extra step in the screening process for remediation helps keep groups small.